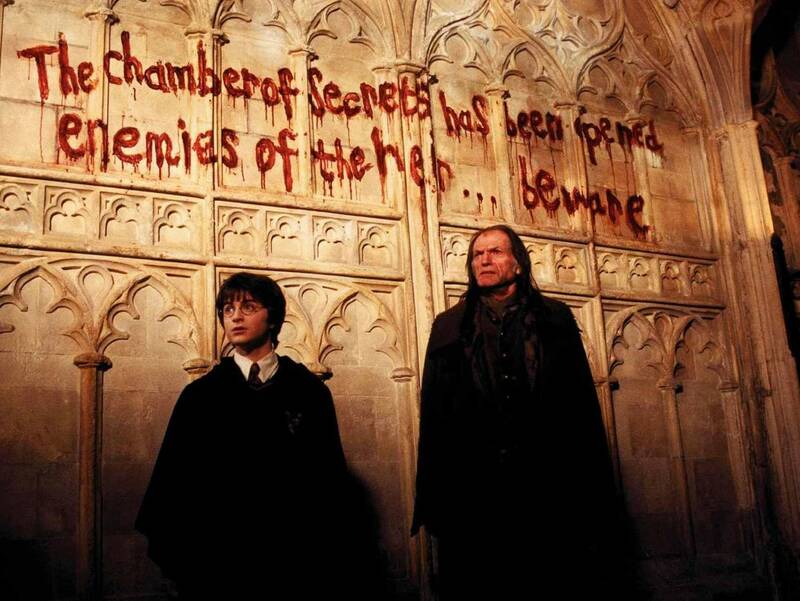 Daniel Radcliffe and David Bradley in 'Harry Potter and the Chamber of Secrets.' Warner Bros. If you're downtown this weekend, you might notice that the Minneapolis Convention Center is hosting its annual convention of witches and wizards. Among the Hogwarts houses, Gryffindor is particularly well-represented, judging from scarves and hats — but the other houses have sizable contingents as well. Some have even placed themselves without benefit of a Sorting Hat. "I just have a Slytherin side to me," shrugged one young boy as he walked out of the auditorium on Friday night. Last year the Minnesota Orchestra took residence in the 3,433-capacity venue for a weekend's performances of the complete, film-synced score to Harry Potter and the Sorcerer's Stone (2001). This year, they're back for the second film in the beloved series based on J.K. Rowling's novels: Harry Potter and the Chamber of Secrets (2002). After the success of Sorcerer's Stone, Warner Bros. didn't mess with a winning formula. The cast members were back, of course — and so was director Chris Columbus, as well as composer John Williams. The composer would remain for one more film in the eight-movie series, but Columbus would be replaced by Alfonso Cuaròn for 2004's Harry Potter and the Prisoner of Azkaban. Chamber of Secrets was also the last film to feature the late Richard Harris as Prof. Dumbledore. The energy in the convention center certainly wasn't lukewarm on Friday night as the audience followed conductor Sarah Hicks's invitation to cheer and boo, vaudeville style, for the story's heroes and villains. That involved some subtle spoilers, if you didn't know the later stories and wouldn't know why Ron's innocent little pet rat rated such scorn. The score is easy to enjoy even while acknowledging that it's not peak Williams. Even John Williams on autopilot is like Misty Copeland before her coffee: still better than almost anyone else. Strings and haunting percussion come to the fore for Williams's Harry Potter scores, unlike in his brassy Star Wars scores (including the brand-new Last Jedi). As they did last year, the Minnesota Boychoir join the orchestra to lend a touch of special magic; when they're not singing, the boys sit patiently and watch the movie, as absorbed as anyone else while they wait for their cues. Williams's music for Fawkes the phoenix is probably the most recognizable theme from this particular score, and Friday's sold-out audience reacted with wild applause when the fiery bird came flying in to soaring strings. As always, it's a moving experience to see the music come to life onstage, drawing out details of Williams's work and illustrating just how crucial an orchestral score can be in bringing emotional weight to a movie. Of course, there are still those who seem not to notice (or care) there are actual humans up on stage playing that music, as evidenced by the typical proportion of attendees who got up and walked out when the credits started to roll, as if they were in a movie theater and not a concert hall. This despite the fact that the live performance ended before the final section of the credits rolled — given the film's 161-minute running time, the players had already accomplished a herculean feat. After the players took their bows to an enthusiastic ovation, the lights came up as the film credits rolled silently on. That silence was a reminder of how we rely on music to conduct us through a movie, and then to see us out...until next time. The Minnesota Orchestra will present Harry Potter and the Chamber of Secrets again on Dec. 16 and 17. Fans of movie music can also see the orchestra present Leonard Bernstein's West Side Story, Feb. 15-17.